Welcome to Mogushan Vaults Heroic mode for Garaj’al the Spiritbinder in Mists of Pandaria. 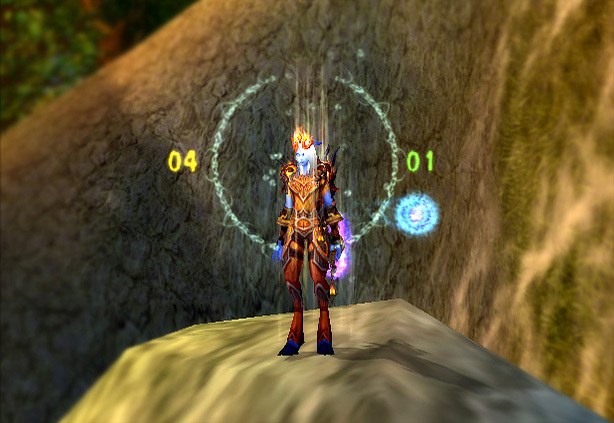 In this guide, I will run you through everything you need to know about how to best utilize your Resto Shaman spells and abilities for a healing showdown. You can bring 4 or 5 healers in a 25man raid the choice is yours depending on how high or low your dps is. However using 5 healers will mean that you are generally cutting it short on tight enrage timer. TIP : Enrage will hit much like Ultraxion’s enrage which will wipe all of your party instead of targeting solo players. There is simply no workaround of that mechanic. Garaj’al’s most prominent ability is his Spirit totems which he will summon every 20 seconds. As a healer what you need to know is when is your turn to launch yourself in that circle of 6 yards along with 4 more players and be ready to cross to the spirit world for 30 seconds. While within the Spirit realm you will need to deal with Spiritual Innervation which stacks on healers and DPS. This will be analysed further below. TIP : Remember that once you have left Spirit Realm, you cannot enter it again for the next 30 seconds or you will die instantly. Another one of Garaj’al’s abilities healers need to be aware of is Voodoo Dolls. Voodoo Dolls effect will last for 60 sec and will be applied to 3 party members one of which will be the tank. (As soon as the Voodoo Dolls debuff expires from the tank, Garaj’al will cast the Bunisment spell on him, which will send him to the spirit world). 70% of the damage taken by each Voodoo Doll is also dealt to the other Voodoo Dolls so tank cooldowns are advised as they are the only way of dealing with that damage. 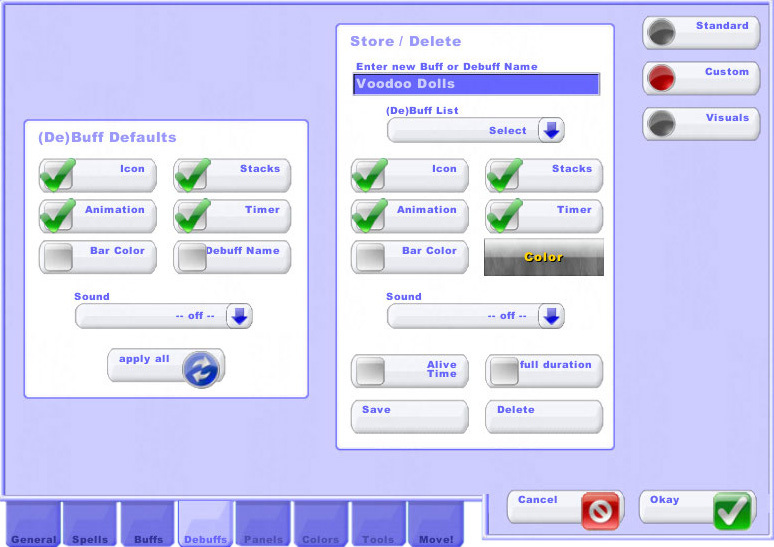 Voodoo Dolls cannot enter the Spirit World (such as through the use of Spirit Totems). TIP : Personal cooldowns such as Astral Shift will not mitigate any damage. Such cooldowns should be saved for when you are entering the spirit world or after Garaj’al reaches 20% of his health. Also remember you cannot enter the Spirit Realm if Voodoo Dolls debuff is applied to you. The last 2 noteworthy abilities are the Shadowy Attack that Garaj’al will unleash every 8 sec to the tank that has aggro and Frenzy. Upon reaching 20% of his health Garaj’al’s attack speed will increase by 50% and his damage will be buffed by 25% .This will last until the end of the fight. 1.For a more in depth analysis of exactly all Garaj’al’s old abilities I suggest reading the following guides. Depending on when you decide to tackle this fight Voodoo Dolls debuff might not show on your Vuhdo. 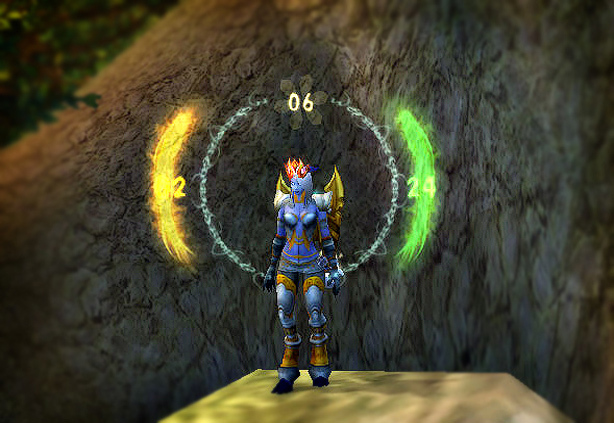 It is imperative that you know which targets are affected as you will need to heal them intensively for 60 seconds. By default Vuhdo will presume that you don’t need extra icons so first thing you need to do is open Vuhdo ->Debuffs -> Standard. 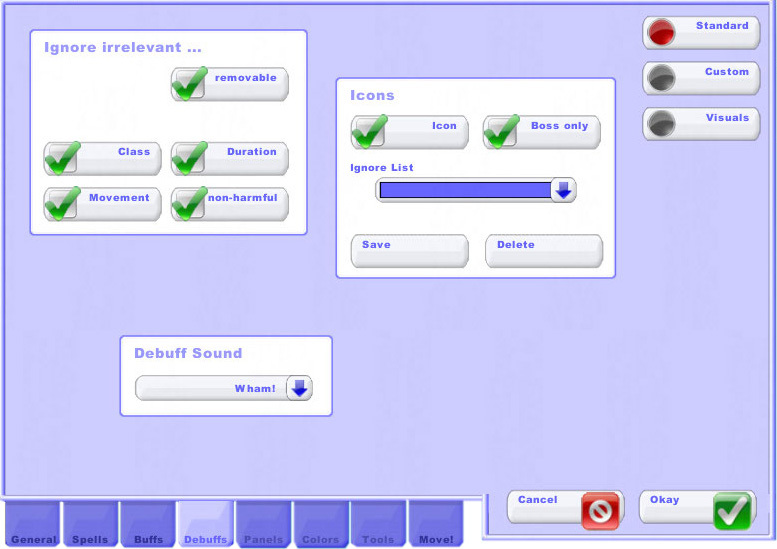 Click on the Icon and save as demonstrated below. If you want only raid icons to show go ahead and click on the Boss icon also. I prefer it but it might not be for everyone. The way to add any custom debuff on Vudho is by opening the interface and navigating to Vuhdo ->Debuffs -> Custom, adding the exact name of the debuff you want to track under Enter new Buff or Debuff Name and saving it as shown below. One of the most discussed matters between healers for this fight due to its ambiguous ingame tooltip. Vixsin from Life in Group 5, was kind enough to shed some light early on to what further testings proved to be the way to handle this buff. Spiritual Innervation will grand a healer with stacks of spirit which will increase their mana regeneration for as long as the buff lasts which is set on 30 seconds. Mechanics around how we gain stacks are not clear ingame. However testings show that any HoT applied to the target that will add stacks will also refresh the buffs timer and any direct cast heavy hitting spell will apply at least one stack. (If you want to know more about stacks and for all classes? Dedralie over at Heliocentric wrote an excellent very detailed post about this. Trust me, you want to read it). It is important that while in the spirit realm you buff yourself and the DPS that accompany you as they are gaining Spiritual Innervation for DPS, and they are buffed depending of their class dealing increased damage for the duration of the buff. The best way to deal with this is pre HoT everyone ( Rolling Riptides to the team that is to enter the realm and yourself ) and as soon as you are in, start casting Healing Surges to top everyone up. Since mana is not an issue feel free to use as many Healing surges as needed in order to top your team because you only have 30 seconds before you escape Spirit Realm before you instantly die. As soon as any member is on full health a new action button will appear on their interface called Return Soul which will allow them to return to the normal realm. It is advised that you don’t overstay your welcome in the spirit realm and leave as soon as you have enough stacks on you and your DPS. 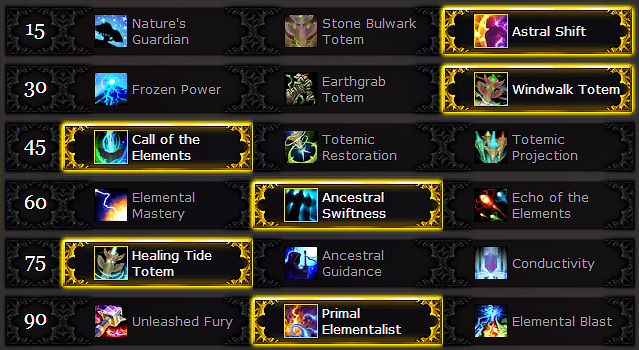 TIP : Healing Tide Totem and AG do not add or refresh stacks of Spiritual Innervation so if you are opting for this talent use it when your raid calls for it in the normal realm. TIP : Use Ascendance in coordination with Healing surge the first time you enter the Spirit realm. TIP : Run with 4 Healers if you are just hitting enrage. For this fight it is suggested that you try and rotate in the spirit realm all your healers at least once. This way you can forgo large chunk of your spirit for secondary stats without feeling the pressure of an empty mana bar. Talents in MoP and glyphs can be rearranged before every fight so don’t hesitate to play around. 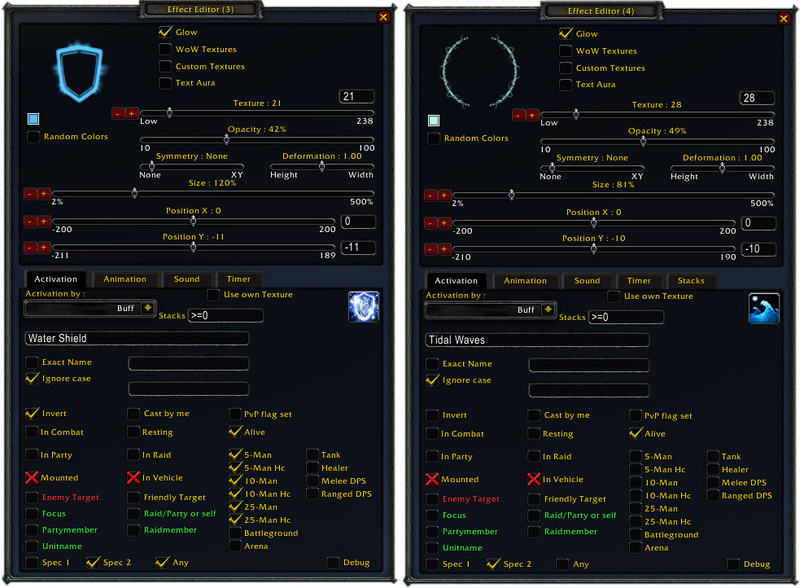 For this fight there are 2 different options for sets of talents and it really depends on how comfortable you feel with either of them in correlation with your gear. 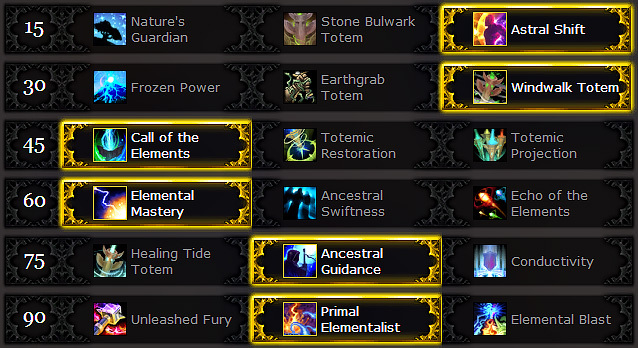 The first set of talents utilizes Elemental Mastery and Ancestral Guidance. By forgoing your additional 5% haste rating you make yourself essentially unstoppable in the spirit realm. By combining the 30% haste of Elemental Mastery with Ancestral Guidance the first or second time you enter the spirit realm and Ascendance the second, you are guaranteed to provide the most stacks for yourself and your party with seconds to spare for when you exit spirit realm. Both of them can be used when Garaj’al is below 20% health and the fight becomes very intense healing wise.Remember for this build you will need to reforge to 3039 haste rating. The second set utilizes Ancestral Swiftness in conjunction with Healing Tide Totem. The benefits of this set rest to the fact that it’s easier for you to reach your second haste cap at 3764 haste rating empowering this way your HTT and HST with one more tick. TIP : Best choose Healing Tide Totem talent when you know you can reach enough haste that you will get that extra tick. TIP : Remember that the first combination requires enough mana in order to be effective, if you are running oom you will find no use for it. The second set requires no mana in order to work. 1. 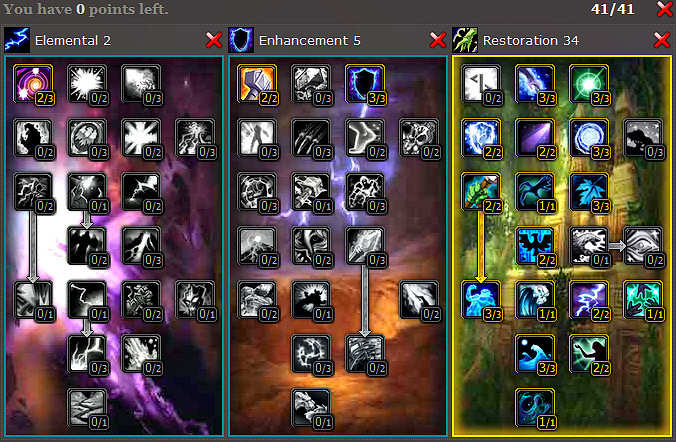 CharDev Example with 477 gear and reforge details for the first set of talents. Haste in this example is as close to 3039 as it gets. Since you didn’t choose AS you are missing 5% haste , 3039 is the equivalent of 871 with AS. For more detailed info on Haste breakpoints refer to the Haste section of my guide on Elitist Jerks. Mastery should be above 50% or as close to it as possible for the extra healing it will provide you and whatever is left we can safely allocate to crit. Spirit is little below 7000 ( 6791) since the fight mechanics are such that unless you are unlucky with your rotation you will have enough mana to heal through. 2. 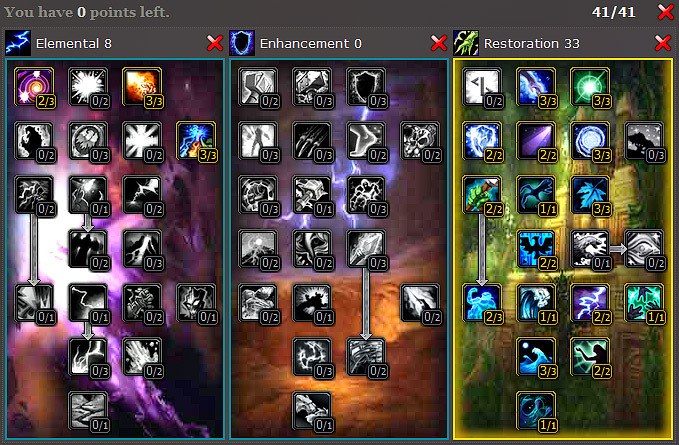 CharDev Example with 477 gear and reforge details for the second set of talents. Haste in this example is as close to 3764 as it gets.You need this much for the extra tick it will provide for HTT and HST. For more detailed info on Haste breakpoints refer to the Haste section of my guide on Elitist Jerks. You will need Glyph of Riptide for this fight as it is important that you pre HoT every member of the team that will go in the spirit realm before hand. Other than that the choice is yours. 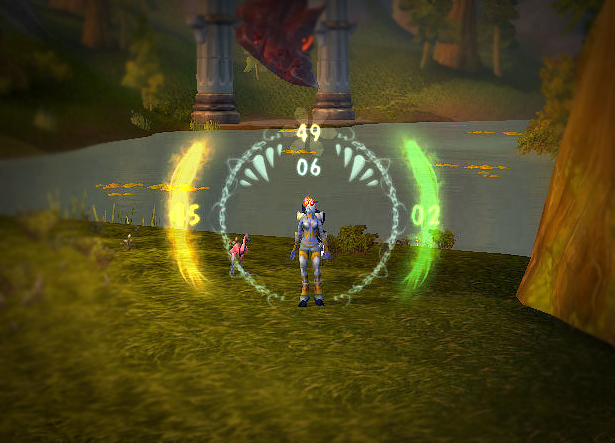 TIP : Glyph of Water shield should not be used for this fight as there is almost no damage to proc it. As always before tank pulls, make sure you have applied Earth Shield on the tank that will start the encounter and you have prehealed him enough (along with the other tank ) so their health is buffed by 10%. Drop Earth Elemental Totem and have it Empower you followed by Healing Stream Totem. Fill in these 15seconds with Healing surges and riptides to the party members that have been affected with the Voodoo Dolls debuff. As soon as HST vanishes drop Mana Tide Totem for yourself and the rest of the healers. Use the rest of the Elementals as soon as they are available and off CD but remember to keep the last Earth Elemental for the last minute of the fight for the extra 20% damage reduction it will offer you and the extra damage reduction cooldown. Drop MTT on cooldown as well but also remember to keep one for the last 40seconds of the fight when all the healers will need that extra mana. After this the rest of the fight becomes borderline rotational depending on what phase you are. Spirit Realm. Before you enter the spirit realm make sure you roll riptides to all of the party members that will enter with you. If it’s the first time you enter , depending on what talents you chose either cast Ascendance and start casting Healing Surges to everyone (make sure you start with yourself) until everyone is topped off so they can leave the realm whenever they want, or push for Elemental Mastery+Ancestral Guidance, thus saving Ascendance for the second time you go in. If you chose the second set of talents start with Ascendance and for the second time you get teleported if you find yourself unable of topping people off drop HTT. Its highly advisable that you don’t however since it neither adds stacks nor refreshes the Spiritual Innervation timer. Try to drop HST instead for the extra help. Normal Realm. While you are outside there are 2 phases. First the phase that follows as soon as you have exited Spirit Realm. After that for 30seconds you will have infinite mana so cast as many Healing surges with Riptides as you can. Once your buff fades you enter a semi conservation phase, where you will heal Voodoo Dolls with Greater Healing Waves, cast Unleash Life before casting any Healing Rains, and using any cooldowns you might still have to help out with tough healing patches. Remember the more adds are still alive in the Spirit realm, the more damage they deal to random members out in the normal realm aside from the damage Voodoo Dolls will apply to specific targets. Frenzy. When Garaj’al enters Frenzy phase, nobody will enter the spirit realm again and he will stop spawning totems. This part of the fight is very healing intensive since Garaj’al’s damage is buffed by 25% and his attack speed by 50%. Note that you will need to have all your cooldowns ready for this final part of the fight in order to keep the raid alive. Supplement with Chain Healing the tank that has aggro ( earth shield and riptide will buff your chain heal by 20% on the tank and 25% overall ), and cast buffed Healing rains on cooldown. This concudes this guide for Garaj’al the Spiritbinder HC .Enjoy the fight and happy looting! Welcome to Dragon Soul Heroic mode for Yor’sahj The Unsleeping. 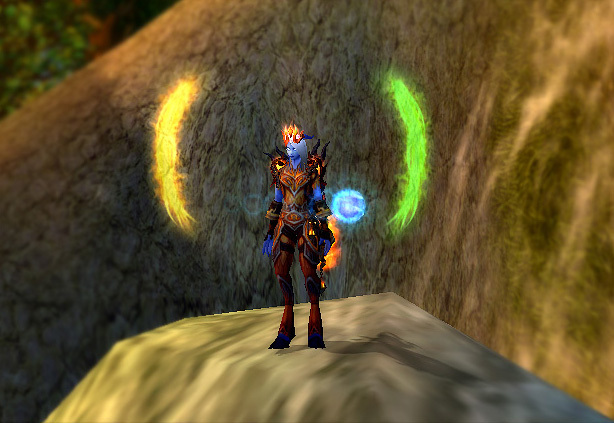 In this guide, I will run you through everything you need to know about how to best utilize your Resto Shaman spells and abilities for a healing showdown. Yor’sahj The Unsleeping has, much like Morchok The Douchekeeper , one main distinction from normal mode. It appears that he’s inspired by Alien so he spawns 4 oozes at a time instead of 3 hence leaving you with the option of having him absorb 3 at the end of their trail rather than 2. I remember when I first saw the normal version in PTR and in various early videos I was left thinking that blizzard has a sick sense of humor. Much like real life. Where you THINK you have a choice when in reality you have almost none. There are 6 combinations that you will encounter randomly in no specific order in this heroic mode fight and in each you have mainly only one choice of what to kill. It sounds scarier than it actually is however.In order to help you with that I suggest installing the addon called Yor’sahj Automatic RaidWarnings that calls out which ooze to kill and lets you know which ones are left. Purple – Gives everyone (except pets) Deep Corruption. Every time someone is healed, they get a stack. If they reach 5 stacks they explode, doing massive damage to the raid. Red – Yor’sahj will cast Searing Blood on 8 random raid members, doing more damage the further away they are. Green – Yor’sahj will cast Digestive Acid, which does moderate damage to random targets which will splash to everyone within 4 yards of them. Yellow – Gives Yor’sahj Glowing Blood of Shu’ma which makes him attack 50% faster and use his abilities twice as often. Blue – Creates a mana void. This will drain everyone’s entire mana pool. When it is killed it will explode and return the mana to everyone within 30 yards. Black – Spawns small adds which will focus on random targets and use Psychic Slice. By this point you should have run at least once the normal mode of this fight. If you were thrown in the heroic version and you need a catch up below are some guides to help you better understand all the in and outs of this boss and for a more in depth analysis of what each ooze will do. TIP : For this fight specifically it’s very important to be able to properly handle Deep Corruption so you will need to have it showing on your healing addon raid frames. The spell ID is 105171 and it’s name is Deep Corruption. If you have VuhDo just go to your configuration screen on the Debuffs tab and then click on Custom. Make sure you have Stacks clicked on both columns then go and find the spell from the dropdown list. For this fight, you will need to be able to dump your mana fast enough in very little time in order to heal your raid. This boss is characterized of the huge amounts of dead time that provides to the healers, making this fight especially easy for Resto Shamans. Equip your talent tree with Telluric currents to get mana back when no healing is needed and Focused Insightto be able to amplify your healing throughput.You will mostly be stationary for the whole fight so feel free to sacrifice your ghost wolf and since no dispelling is necessary remove a point from that too. Below is an example of how your character should look like. 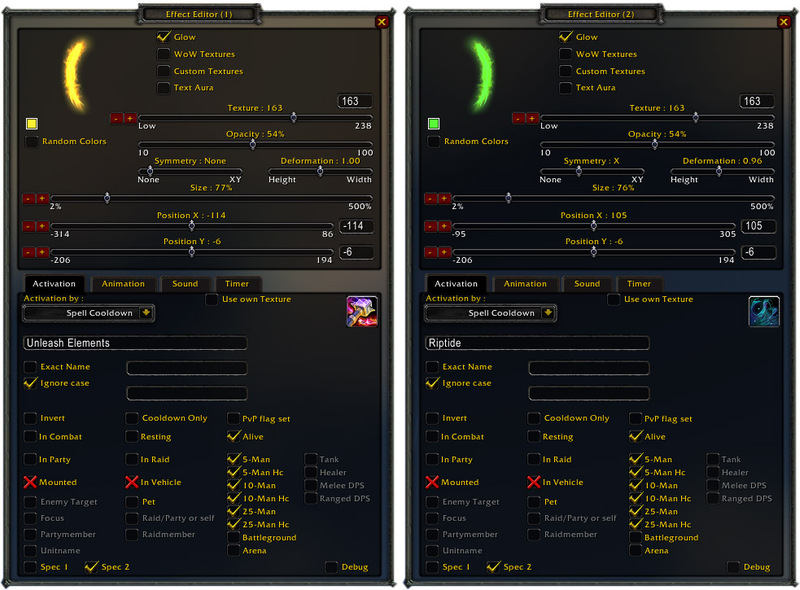 Gear, reforging, talent tree and glyphs included. Haste in this example is around 2005 in order to help you cast faster and give your riptide one more tick. Mastery should above 18 or as close to it as possible for the extra healing it will provide you for when your raid hits all time lows. Spirit is little above 3200 (counting the proc from Heart of Unliving ) in order to have enough to dump with your fast spells. All items used are from Normal Dragon Soul as this is an entry level Heroic boss. Make sure your weapon is imbued with Earthliving Weapon enchant and your Water Shield is up . Put Earth Shield on your tank and keep it up at all times .Start the tank so that your well spent Ancestral Healing talent points will proc that wonderful 10% damage reduction and 10% maximum health pool increase. After you see you can’t climb more on his health cast riptide on him.As long as riptide is ticking the stacks will never drop thus securing the tank an extra 10% damage reduction and health pool increase throughout all the fight. Run with the tank and stand behind the boss. Drop your totems at your location. Before the Oozes. Since nobody is getting any damage besides the tank focus on him. Renew his riptide if needed and heal him with greater healing waves or sustain him with healing waves if he doesn’t drop too low. Casting of the Oozes. After a few seconds he will start casting for the first set of oozes. This is your major downtime where no healing whatsoever is required so as soon as the tanks health is full start casting lightning bolts to fill your mana pool back up. Merging of the Oozes. Healing on this phase is very dependant of the combination of the oozes. 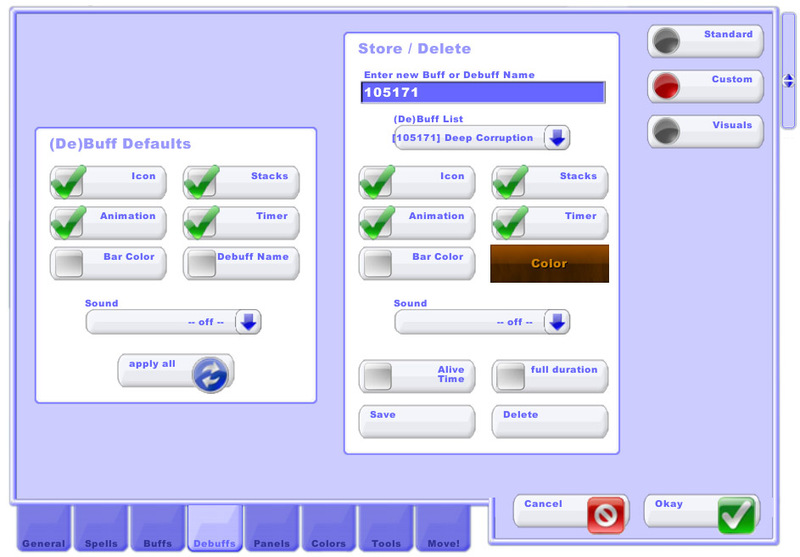 There is a total of 6 possible combinations as following. Unless there is a green ooze up ALWAYS stack under the bosses bottom. No excuses if you don’t. Kill Yellow to control some of the damage. With Red up you’ll need to stack and with purple up you will need to handle Deep Corruption . 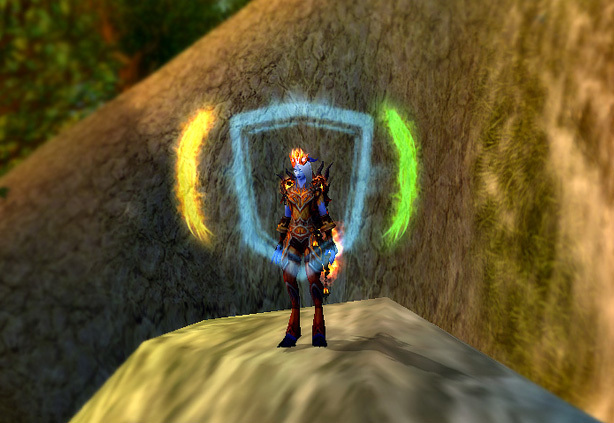 Below is a list of how all shaman spells and how they react to the debuff. —> Healing Rain – 1 stack upon entering. If you leave and re-enter, you gain another stack. Tip. Divide your raid into 2 groups of 5 before you start the fight.This way every healer will be left with a group of 5 to heal through. Tank assignment. Refresh Earth shield if it drops and cast riptide just a sec before the oozes merge. 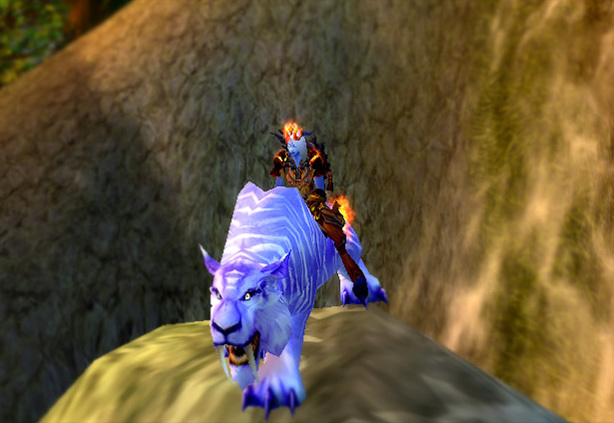 Unleash your weapon at a hunters or warlocks pet if you can’t afford another stack on another member. This will boost your next direct heal for 20%. Remember your mastery will boost your heals the lower the targets health is, so feel free to allow the tank to drop a little below 50% before you heal him with a greater healing wave. You only have up until 4 heals before you blow him up and the raid so it’s crucial to maximize your heals as much as possible before you heal anyone. So while keeping an eye of the tanks health Unleash life and spam the boss with any shock spell to take advantage of your Focus Insight talent that will give you an additional boost. Always heal the tank with amplified greater healing waves.Keep your tidal waves up by casting riptide on cooldown which will gradually heal members up while only giving one stack and make your next casts much faster. If anyone is in danger heal them with greater healing wave. Raid assignment with no tank. While you don’t have the tank to heal don’t forget to refresh his earth shield if its lost. Heal the raid members as stated above and have in mind to heal the tank in case of an emergency with an instant amplified greater healing wave. You may place a healing rain down, in a 10man it will not wipe the raid but have a discussion with the other healer first. Stack since Red is up. Handle Blue as above. Drop healing rain on cooldown, refresh riptides on cooldown, chain heal from the lowest and cast greater healing waves at people that are fixated from the Black adds. If someone is in big trouble spam 2 healing surges on them followed by greater healing wave. This is the hardest combination.You should keep all your healing cooldowns for this.Start the phase by casting heroism (or anyone in the raid that can afford wasting mana on Heroism or Time warp.) Pop your Spiritwalkers Grace in you have a 4pc set bonus for the extra haste but save it for at least 10 sec into the phase. Converse with the other healer about when to drop your spirit link totem.Either start with it or drop is AS SOON as the other healers cooldown fades. Spam the boss with any shock spell on cooldown to amplify your next healing rain and keep casting chain heals in between.If anyone is low or even worse the tank use greater healing waves to patch them up. Handle Blue as above. Handle Purple as above. Spead 4 yeards and handle Blue and Purple as above. This concudes this guide for the Heroic Yor’sahj healing showdown. Always cast lightning bolt while Yor’sahj is casting forth the oozes. Unless there is a Green Ooze up ALWAYS stack under the boss. And in case there is purple ooze up please DO NOT use chain heal. Enjoy the fight and happy looting!